Trevor Baird: born and raised in Northern Ireland was Chairman of a local motorcycle club for four years in the 1990s. From taking part in the Bigger than Borders demo in 1995 he eventually became the Motorcycle Action Group (MAG) UK’s Regional Representative for Northern Ireland, before moving to mainland UK in 2002 where he worked as a full time employee for MAG UK, first as Director of Public Affairs and then as General Secretary. 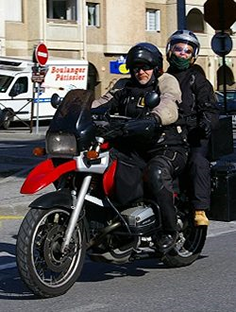 During this time Trevor was also a representative at the Federation of European Motorcyclists Associations (FEMA) which is made of twenty four national rider organisations from 19 countries across Europe. In 2008 Trevor left MAG UK and became FEMA’s Technical Officer representing an International Coalition of organisations from Europe and the USA at the United Nations Economic Commission for Europe (UNECE) via the World Forum for Harmonization of Vehicle Regulations (WP.29) and the Working Party on Road Traffic Safety (WP.1), returning to Northern Ireland in 2009 and setting up Right To Ride. Trevor’s history of motorcycling is long – starting on a Yamaha DT 175MX in 1977, before getting hooked on the BMW GS styled bikes in the late nineties, moving through from the 1100GS to the R1200GSA Adventure – but now downsized to a F800GS. In between there has been a K1200RS, a Fireblade and a motorcycle and sidecar combination. Although dealing with riders issues, road safety is always a factor, so Trevor has been involved in the setting up of initiatives such as Ride It Right – First Aid For Riders and Biker NI Safety Cards. Elaine Hardy, PhD: born in Australia and moved to England in 1992. In 2003 Elaine joined MAG UK and became the organisation’s Research Officer, also representing MAG UK at FEMA from 2004 to 2007. Between 2007 and 2009 she was FEMA’s Research Officer. Elaine’s background is vehicle data analysis and has worked for many years with government agencies especially in the area of vehicle crime research. Previously she was the President of the International Association of Auto Theft Investigators (IAATI) in the UK. She has written numerous papers on motorcycling issues for MAG UK and FEMA. More recently as Research Director of Right To Right Ltd, Elaine has carried out research projects including an in depth analysis of motorcycle fatalities in Northern Ireland and has presented the findings of her work at major international motorcycle conferences such as the IZF conference at the INTERMOT Fair in Cologne, Germany (2012). In 2014 Elaine completed a study the “Northern Ireland Pedestrian Fatality Report 2014” supported by the Rees Jeffreys Road Fund. The study is an examination of n.55 collision scene reports of pedestrian fatalities from Senior Scientific Officers of the Road Traffic Collision Investigation Unit, Forensic Science, Northern Ireland (FSNI).